Structure refers to the components that create the health system and includes aspects such as the adequacy of facilities (e.g. does a health facility provide the necessary components for a caesarean section? Are supplies available for resuscitation of the newborn? ), management structures, staffing and the overall organisational design of the system. Facility surveys can provide data on the availability of drugs, equipment and supplies but may not provide much information on the organisational and management aspects. Local and national studies and assessments may be available in some countries and may provide a more holistic overview. Tools such as the Johns Hopkins Primary Care Assessment Tool (PCAT) include consumer-client surveys, facility surveys, provider surveys and heath system surveys; which may offer learning opportunities for MNH. The Institute for Health Metrics and Evaluation have supported the use of the Access, Bottlenecks, Costs, and Equity (ABCE) assessment tool in a number of African countries, including Kenya where facility surveys, client experiences, costings and trend data provide a multi-pronged approach to assessing service delivery. The core SPA questionnaire reflects generally accepted standards for health care services, WHO and USAID’s service readiness indicators, UNICEF immunisation guidelines, and standards set for MNH care. Several SPA’s have been completed in a number of LMIC’s. WHO Service Availability and Readiness Assessment (SARA) – a health facility assessment tool which sets indicators for measuring service provision. Like the SPA survey this assessment covers basic health-care interventions relating to family planning, child health services, basic and comprehensive emergency obstetric care, HIV, TB, malaria, and non-communicable diseases. Check your knowledge: What information do service provision assessment (SPA) surveys provide relevant to MNH? If you are not sure follow the link above to find out. Infrastructure, resources, and systems such as water, electricity, latrines, infection control, and management systems. The extent to which approved guidelines and standards are being followed and met. Availability of vaccines, contraceptives, medicines and other essential supplies. Availability of curative care services and outpatient care for newborns and children. Availability and assessment of antenatal care, delivery services, newborn care, emergency obstetric care. Availability of essential equipment to provide a basic package of services. Use of fees for services. Provision of sexual and reproductive health services. Although often used interchangeably, the terms process indicators and signal functions are distinct. Amount of emergency obstetric care (EmOC) services available. Geographical distribution of EmOC facilities. Proportion of all births in EmOC facilities. Met need for EmOC services. Cesarean sections as a percentage of all births in the population. Ideal ‘targets’ were set: for example there should be a minimum of one comprehensive EmOC facility and a minimum of four basic EmOC facilities per 500,000 people. The value and relevance of these targets has been questioned particularly in resource poor settings. The guidelines also identified a set of obstetrics signal functions which are not comprehensive but which are indicatve of a facility’s abilty to provide EmOC. 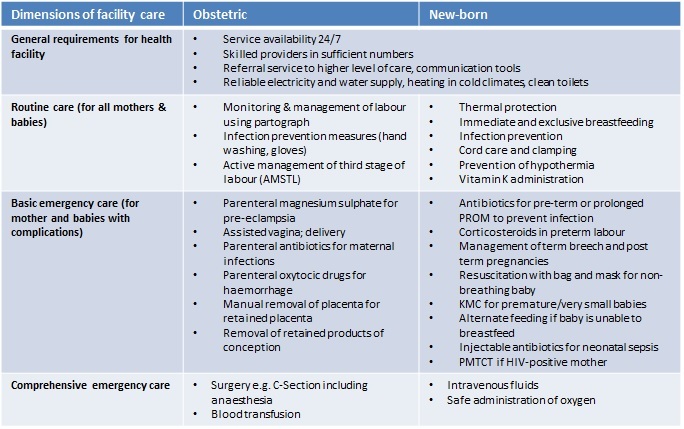 Figure 4.1 below outlines the signal functions and those proposed for newborn care. All EmOC designated facilities are expected to be able to perform six of the basic obstetrics functions whilst comprehensive EmOC facilities must also perform and additional two. The information is usually collected using facility surveys. There are some limitations with this approach; as with any assessment the findings in some areas are likely to reflect the situation at that particular time. Additionally the data do capture some processes of care but not its appropriateness. The acceptability of the level of attainment of the signal functions can also be subject to interpretation and require target setting: for example is it necessary to score 100% in all signal functions, and over what period of time? For more information read Paxton A, Bailey P, Lobis S. (2006), Gabrysch S, Civitelli G, Edmond KM, Mathai M, Ali M, et al. (2012), WHO UNFPA, UNICEF AMDD (2009), and Bhutta, Z., Das, J., Bahl, R., Lawn, J., Salam, R. et al (2014). Demographic and Health Surveys (DHS) are surveys that are conducted house to house to provide population based data on health and associated socio-economic factors. The DHS Program conducts nationally-representative household surveys using approaches which are internationally comparable and comparable over time. Generally, funds permitting, a larger survey is conducted every five years and a more focused one in the interim period. Data on coverage relating to antenatal, delivery and postnatal care are available as well as levels of maternal and neonatal mortality. The DHS Program data also collects an indicator used extensively in MNH, the proportion of deliveries with skilled attendants (health professionals). The DHS are not the only surveys which provide data on coverage. For example, the Multiple Indicator Cluster Surveys (MICS), conducted by UNICEF provide similar data in some countries. Different methods, definitions and baselines are used in these surveys which may result in two different estimates for the same indicator, so the findings from different types of surveys are not always comparable. In summary, house to house surveys and facility surveys provide a rich source of data on structural aspects of quality in MNH. We will turn now to the capture of information on the dimension of process. Institute for Health Metrics and Evaluation (IHME), (2014) Health Service Provision in Kenya: Assessing Facility Capacity, Costs of Care, and Patient Perspectives. Bhutta, Z. A. et al, (2014) Can available interventions end preventable deaths in mothers, newborn babies, and stillbirths, and at what cost? Gabrysch S, Civitelli G, Edmond KM, Mathai M, Ali M, et al. , (2012) New Signal Functions to Measure the Ability of Health Facilities to Provide Routine and Emergency New-born Care. Paxton A, Bailey P, Lobis S. , (2006) The United Nations Process Indicators for emergency obstetric care: Reflections based on a decade of experience.